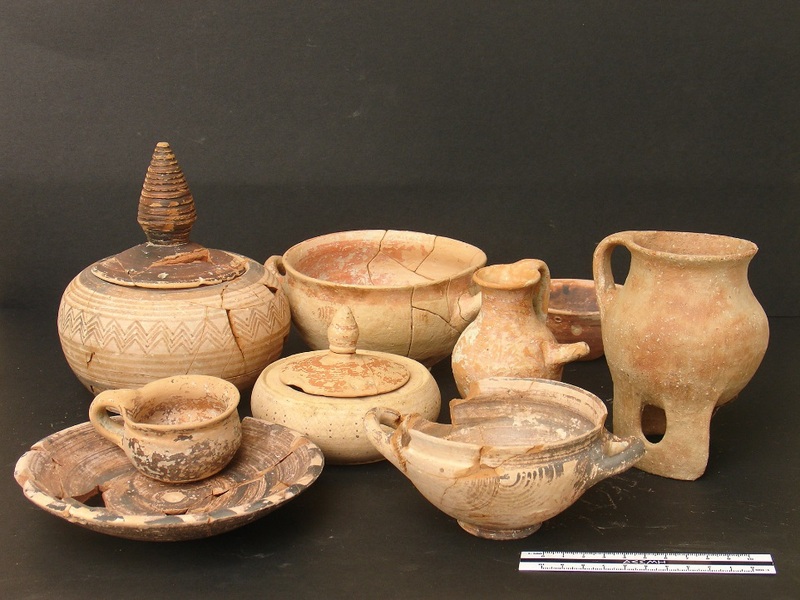 The Artemision of Amarynthos exploration project is since the outset the result of a close collaboration between the Swiss School of Archaeology in Greece (ESAG) and the Ephorate of Antiquities of Euboea (EAE). The research project, supported by the Swiss National Science Fondation, is placed under the co-responsability of Karl Reber, director of ESAG, and Amalia Karapaschalidou, former director of EAE. Fieldwork is directed by Tobias Krapf, Scientific secretary of ESAG. The scientific direction also associates Denis Knoepfler, former professor at Collège de France and Neuchatel University and instigator of the research project, Thierry Theurillat, Scientific secretary of ESAG, and Sylvian Fachard, former Scientific secretary of ESAG and currently Mellon Professor at ASCSA. 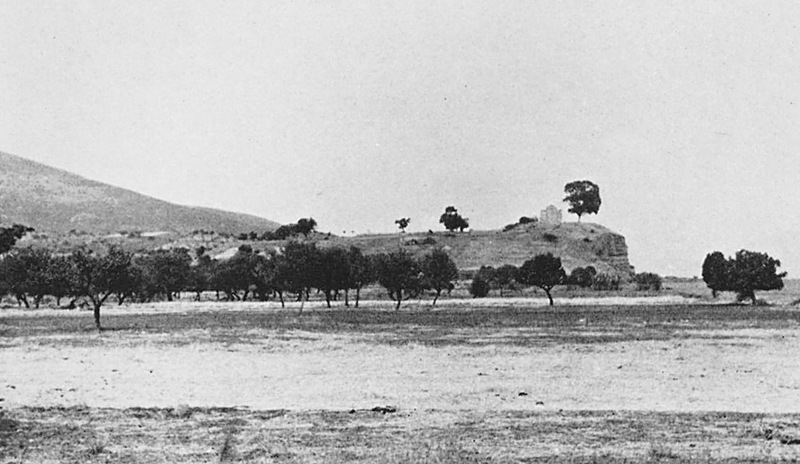 The Paleoekklisies hill is a coastal eminence that occupies the eastern edge of the Sarandapotamos river drainage basin, probably called the Erasinos in Antiquity. 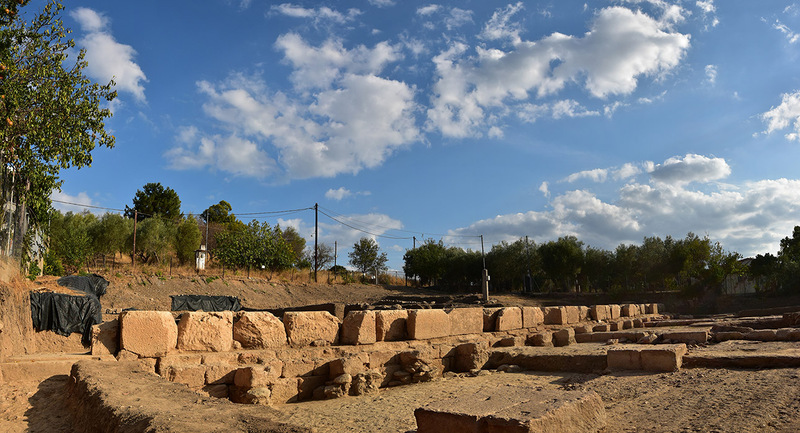 Thanks to a geoarchaeological project in collaboration with the French CNRS-CEREGE directed by Matthieu Ghilardi, the paleoenvironment of the Artemision can be reconstructed and shows significant change since Antiquity. 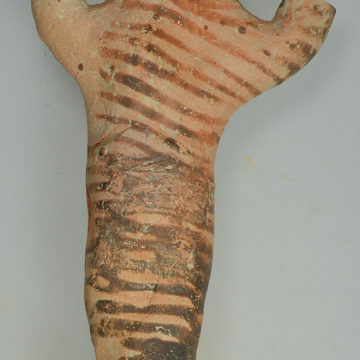 From the Early Holocene to c. 2,600−2,400 BCE, the area was characterized by a fully marine environment. 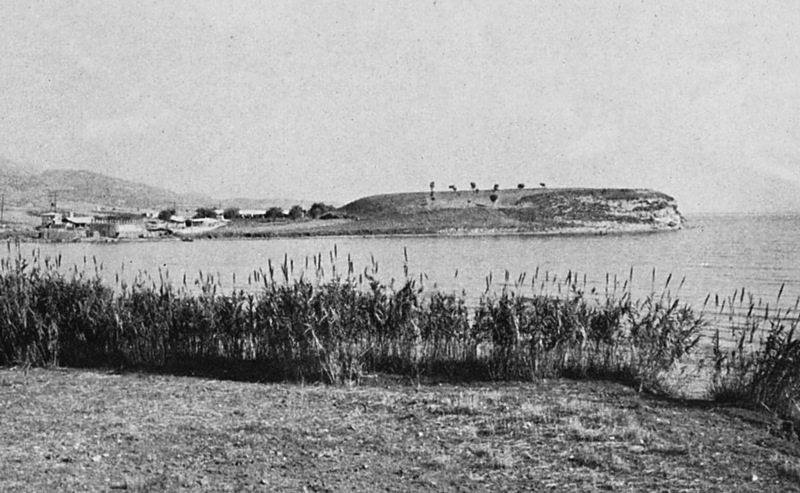 The latter then developed into a brackish/closed lagoon from the Early Helladic to the Late Geometric period (c. 750 BCE), mostly due to the deltaic progradation of the Sarandapotamos river. From the end of the eighth century BCE onwards, the lagoon was progressively replaced by swamps. The Sanctuary then developed in a constraint environment, in between coastal marshes to the west, a rugged promontory to the east, and the sea shore to the south. Such a landscape is typical of the setting of other sanctuaries of Artemis lying along the Euripus Strait and further south at Brauron, Halai, Aulis and Istiaia. 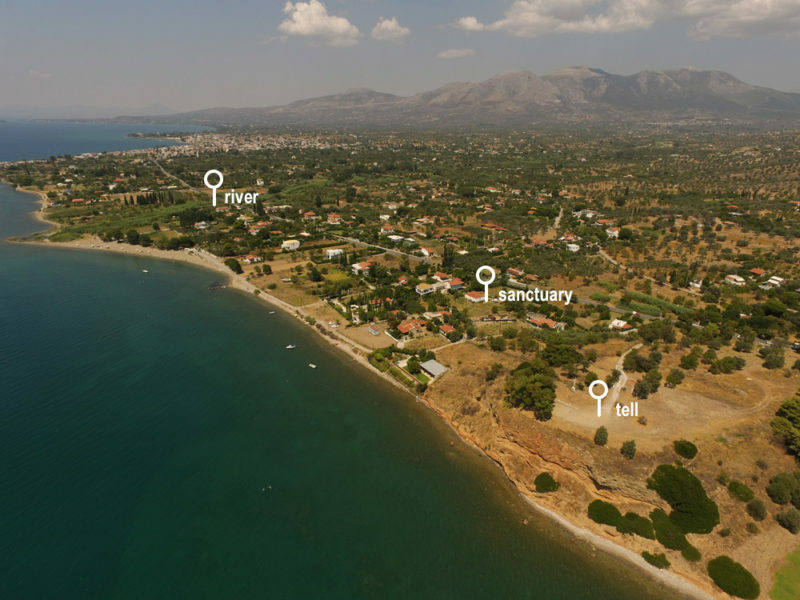 Matthieu Ghilardi et al., Reconstructing mid-to-recent Holocene paleoenvironments in the vicinity of ancient Amarynthos (Euboea, Greece). Geodinamica Acta 25.1-2, 2012, 38-51. The topographical setting of this coastal hill is typical of the region’s Bronze Age sites and shares many parallels with Drosia, Dramesi, and Lefkandi. The latter, in particular, bears close similarities to Paleoekklisies, with its two anchorages (now silted up) behind the tell. Architectural features belonging to all Bronze Age phases have been excavated on top of the hill by the Greek archaeological service in the 1980s. 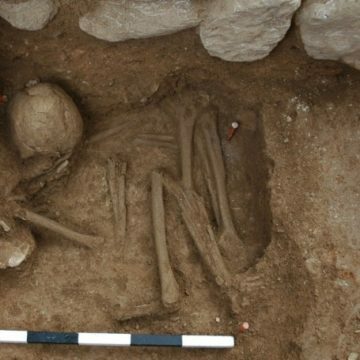 A Middle Bronze Age settlement was also partially excavated north of the hill, which indicates that the site extended beyond the confines of the tell around the prehistoric lagoon. 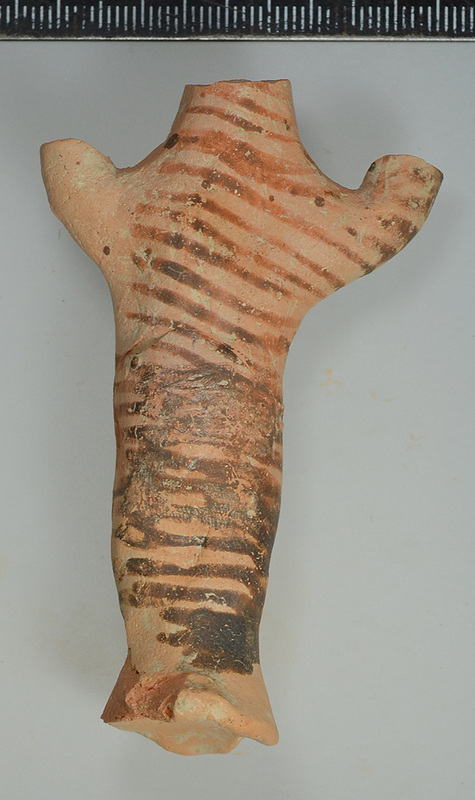 Mycenaean figurines, human and animal, found in the slope deposits are too few to support early cult activity at the site. 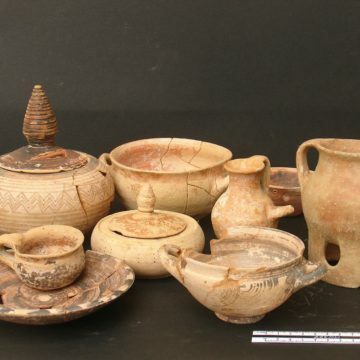 The finds, however, indicate the presence of a sizeable settlement, no doubt the only major Mycenaean site located between Aliveri and Lefkandi. 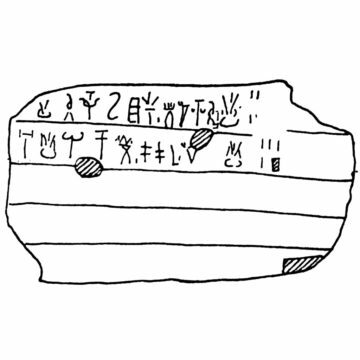 This supports its identification with Late Bronze Age a-ma-ru-to, attested on a Linear B tablet and on an inscribed sealings from the Theban Kadmeia. Tobias Krapf, Ερέτρια και Αμάρυνθος: δυο γειτονικοί αλλά διαφορετικοί οικισμοί της Μέσης Εποχής Χαλκού στην Εύβοια. In A. Mazarakis Ainian (ed), 4ο Αρχαιολογικό Έργο Θεσσαλίας και Στερεάς Ελλάδας, Conference held in Volos (15.3-18.3.2012). Volos 2015, 681-696. 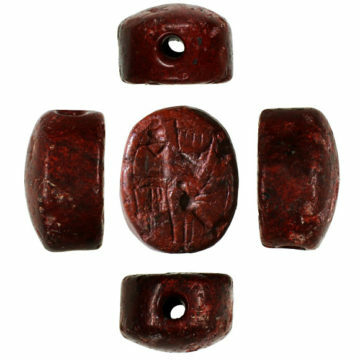 Our knowledge of the transition to the Iron Age and the occupation of the early first millennium BCE on the site is still fragmentary. Early Iron Age remains are absent from the summit of Paleoekklisies hill, but discoveries made at the foot of the promontory show that the edge of the cove created by the Prehistoric bay was occupied between the Protogeometric and Geometric periods. 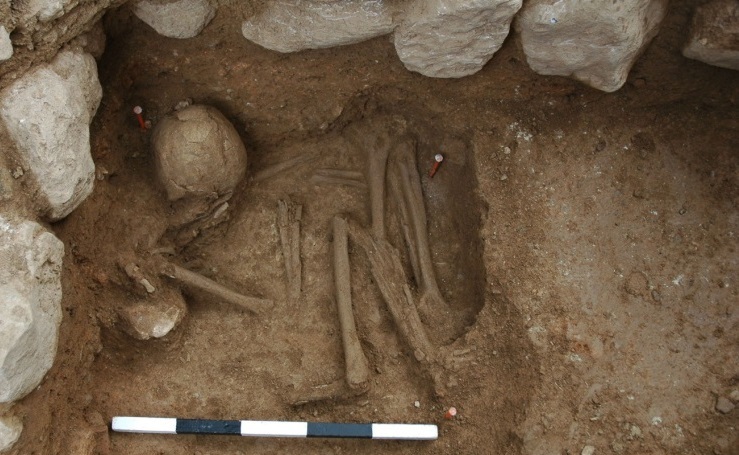 The oldest remains are burials, including a MG I child grave containing 9 vases, and a massive eighth-century BCE wall, 80cm wide, partially excavated under the East Stoa. An Early Archaic building in antis is reminiscent of the monumental public ‘halls’ discovered throughout Greece, such as Emporio, Eleusis or Kalapodi. In plan the building is at least 12.50m long and 5.5m wide; two antae made of orthostats were carefully laid out, forming the entrance to the building on the north-east. Its southern extension remains unknown. A gravel roadway ran alongside the building, edged by a terrace wall serving as a limit. 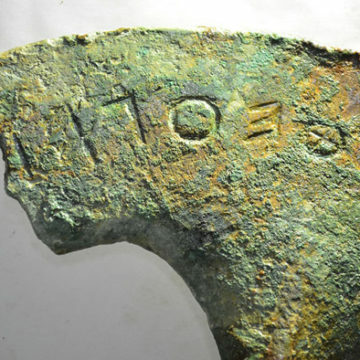 A pit situated between the roadway and the building contained a fragment of a small bronze wheel, which bears the name Θεογ− inscribed from right to left. 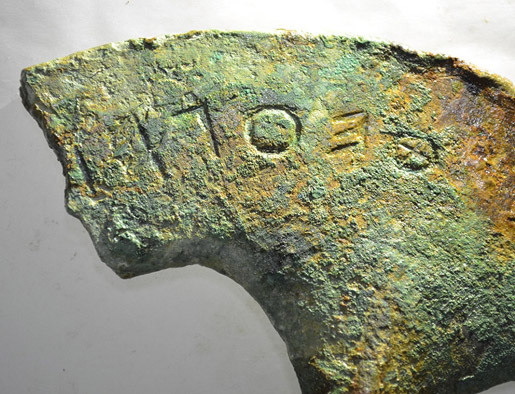 Other votive offerings from the eighth and seventh centuries BCE were also discovered out of context in later backfills: fragments of bronze shields, a serpentine seal from the ‘Lyre Player Group’, as well as several graffiti inscribed on pottery and terracotta. Claude Léderrey, Ein subprotogeometrisches Kindergrab. AntK 51, 2008, 159-164. Béatrice Blandin, Amarynthos au début de l’âge du fer à la lumière des fouilles récentes. 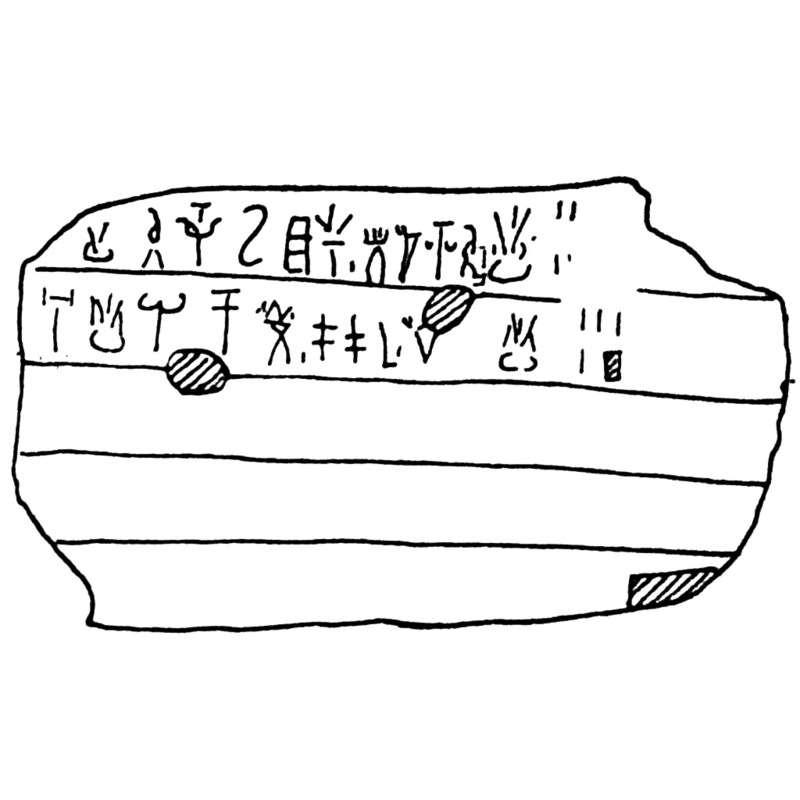 AntK 51, 2008, 180-190. 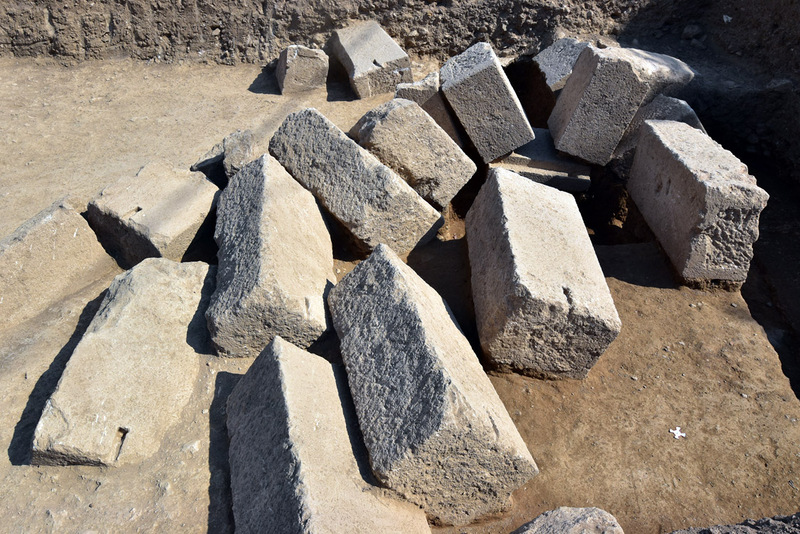 In the course of the fifth century BCE, a tamped roadway (at least 3.5m wide) was built over its Archaic predecessor, following the same orientation and delimited on one side by a new rubble wall. Traces of wheel-ruts are preserved on its surface. In the first half of the fourth century, a rectangular building opening onto the west was built on the Classical roadway. Its plan, only preserved to the level of its foundations, measures 12×9m, with two bases meant to support semi-engaged pilasters separating the interior into two equal spaces. 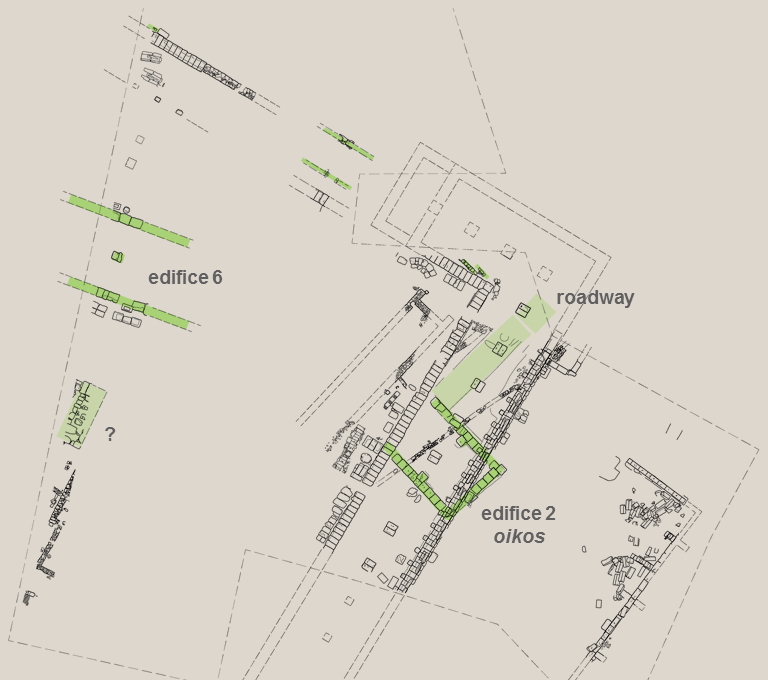 The plan is reminiscent of oikoi, buildings of various functions that are found in sanctuaries. A second monumental building made of two parallels foundations and a probable axial colonnade was discovered under the basement of a modern house. 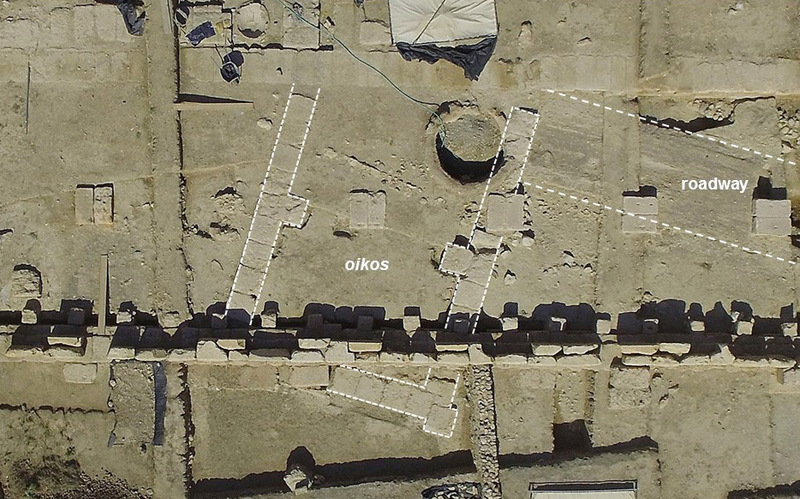 The plan and the pottery recovered suggest the edifice could be a fifth century BCE portico or temple/oikos. A monumental limestone structure further south also belongs to the Early Classical period. 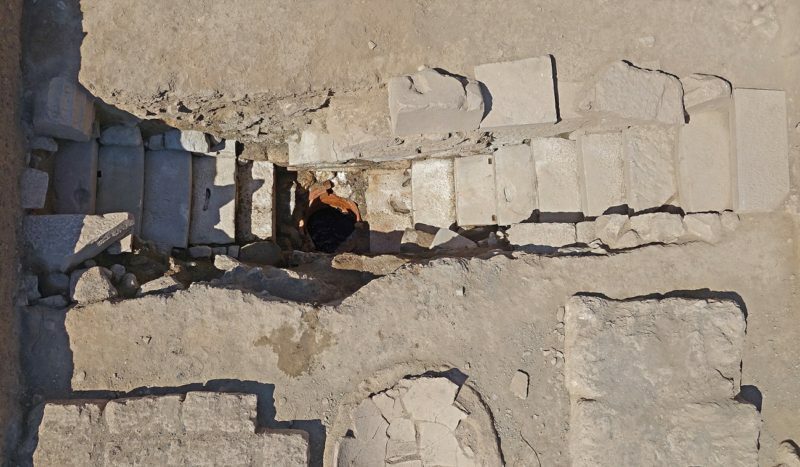 The most impressive discovery to date is an elongated two-aisled winged stoa, 11.80m in width and at least 50m in length. It overlies the earlier roadways and has a similar SW-NE orientation, thus maintaining the structured axis in place since the seventh century BCE. The projected wing is prolongated further to the north-west by a one-aisled stoa. Together the two porticoes border a large courtyard, maybe the aulè mentioned in the Eretrian law of the Artemisia (IG XII 9, 189). 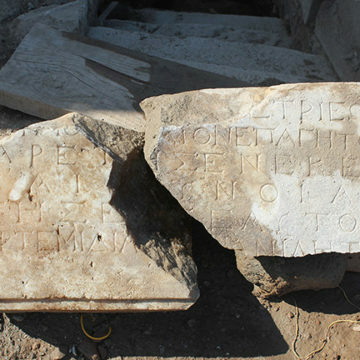 Only a portion of the Eastern stoa has been excavated. The front colonnade rests on a foundation made of two courses of conglomerate blocks. The colonnade had a Doric entablature, attested by the discovery of a limestone frieze block with a three-metope span, as well as a fragment of the cornice. 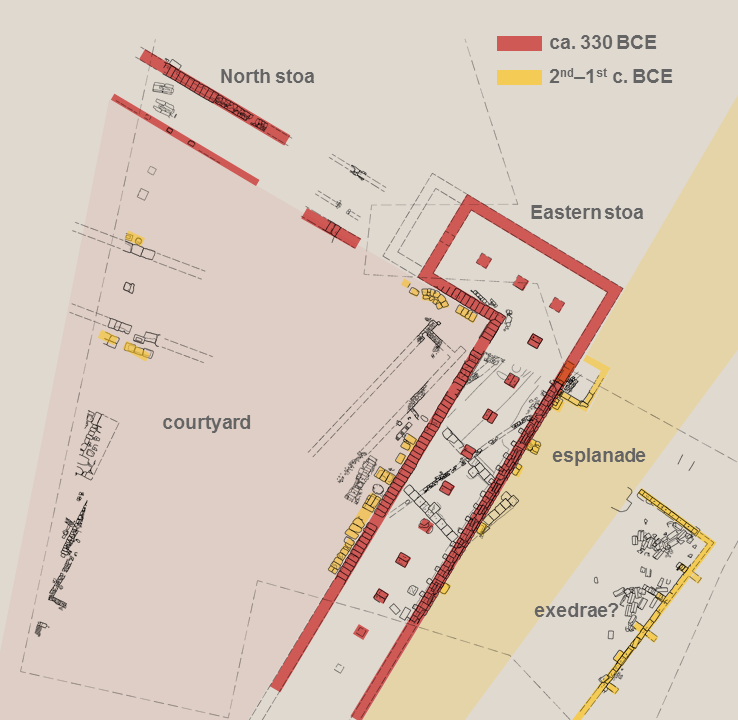 The stoa had a double-faced central colonnade with an intercolumniation of 5.20m. The overall plan is ordered according to a 5.20m module, probably the equivalent of 16 Doric feet, which regulates the inner colonnade as well as the depth of the two aisles. Most of the limestone colonnades or the entablature were probably consumed in a Medieval lime kiln built on the facade of the stoa. The back wall of the stoa consisted of a mud brick elevation on a dressed stone socle, made of two rows of orthostats averaging ½ ton. The floor of the stoa was made of beaten earth. 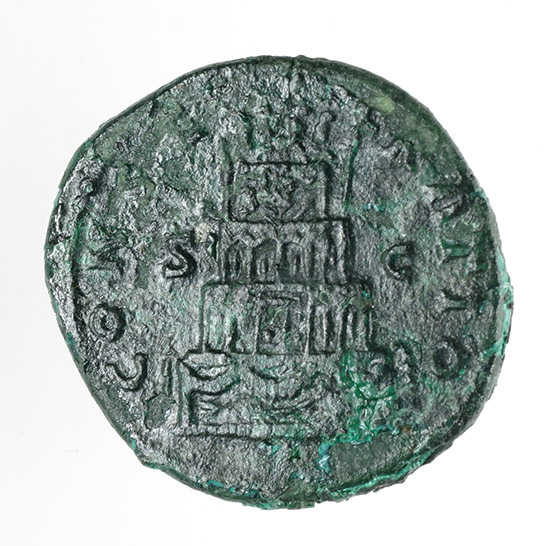 Regarding the chronology of the stoa, the excavation of the foundation trenches provided a firm date in the second half of the fourth century BCE, probably in the third quarter. In a second phase (third century BCE), a stone bench was added along the back wall of the stoa, whose foundation blocks only survive. 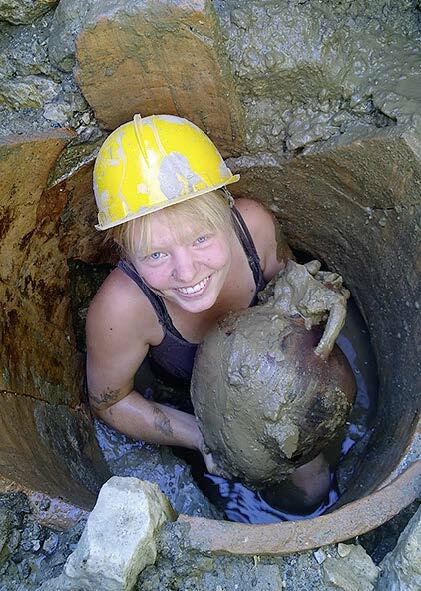 A single limestone base and a fragment of support have been recovered. In its last phase (third century BCE), a door and a propylaion were added in the backwall of the building. 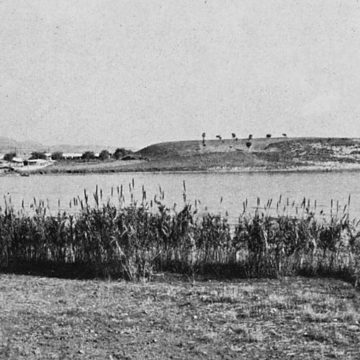 A large esplanade was laid out east of the stoa, extending towards the foot of the Paleoekklisies hill. A building made of ashlar masonry was partially embedded into the hill and made accessible through a beaten earth ramp. The plan of the building remains unknown, as only the north and east walls have been excavated. The side (north) wall is 10.90m and 0.56m wide; an 22 meter-stretch of the back (east) wall is visible and continues towards the south. The back wall was supported by engaged pillars acting as internal and external buttresses, constructed to resist the lateral pressure of the soil. In spite of the pillars, however, the rear wall fell apart, and its blocks were scattered inside the building. Based on the position of the collapsed blocks on the beaten earth floor, the rear wall was at least 2.25m high in five courses. 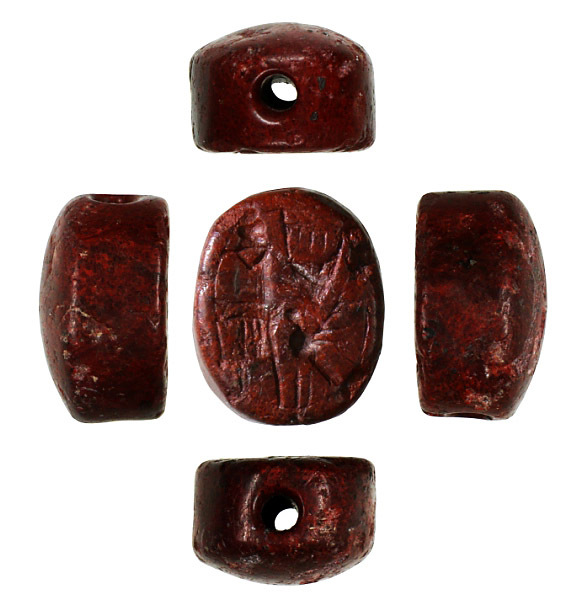 The isodomic blocks display a very high quality of craftsmanship. The monument, whose chronology in the Late Hellenistic period is uncertain, might have been an analemma, an exedra, or even a portico. The vast courtyard bordered by porticoes housed votive monuments, of which several bases survive. 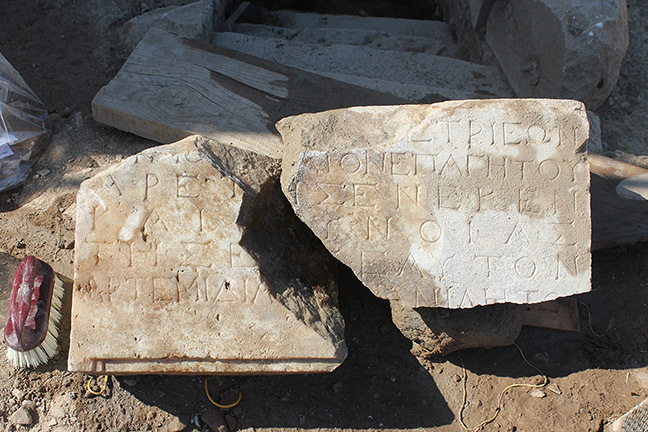 Few fragments of sculptures and inscriptions were found, most of them were probably recovered in late Antiquity. Fortunately, the fortuitous discovery of a Roman well entirely built with reused stelae, bases and architectural members shed some light on the votive monuments that once adorned the sanctuary. 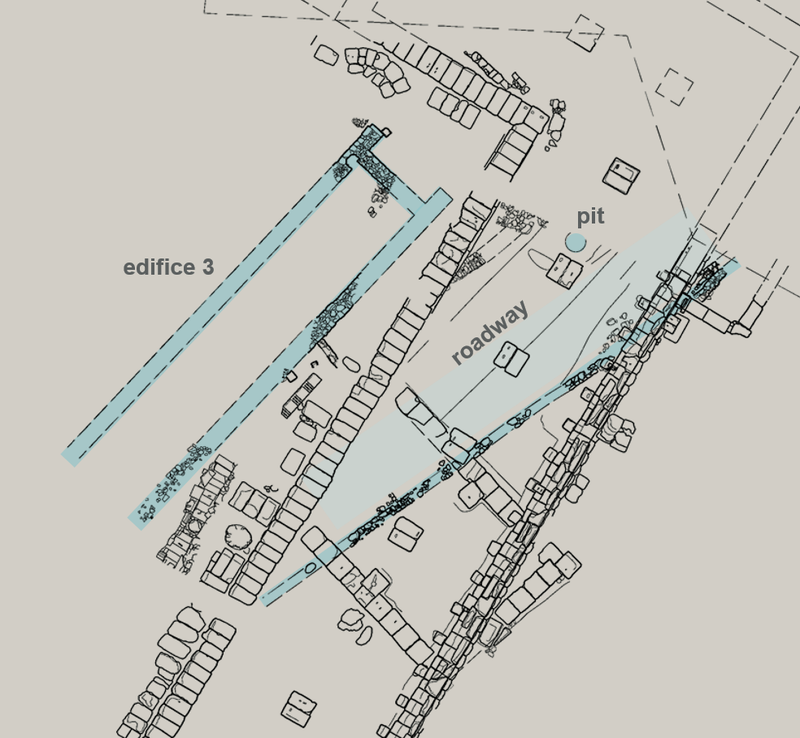 This intriguing underground structure was accessible by two opposing flights of stairs. More than 150 bronze coins were found on the stairs and in the well, suggesting that the structure might have had a ritual function. The last phases of the sanctuary are still poorly known. It served as a place of cult practice until the Roman period, when it was partially dismantled. 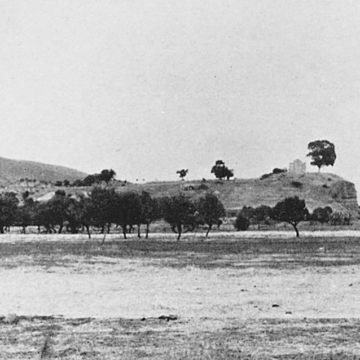 One or two centuries later, early Christian tombs testify to the symbolic force that the place still exercised.